Webstorage as name suggests automatically uploads photos to the Webstorage. When ‘Instant Upload’ is enabled,photos taken with your device’s built in camera will be automatically uploaded to web storage.After we did hit on start, it connects to the web server which on a click of button on ‘My Sync Folder’ adds documents,photos,videos and audio recordings to web storage.The files uploaded to web storage will be available to your computer and other devices.You can add a new folder,you can upload or you can refresh. So Audiowizard takes you to speech mode where you can either choose smart mode,music mode,movie mode,recording mode,gaming mode or speech mode.It tunes the tone accordingly.Splendid meanwhile helps you choose color you want to see in your device both as temperature and enhancement.Food pictures look awesome specially when enhanced. Now generally we are so used to using kindle on kindle that this pre-installed app looks like a surprise element.In fact you wouldn't have to install anything else apart from the ones installed.These all are like your utility tools.So whether you are reading novels,children’s book,comics,magazines you can read all of them right here. 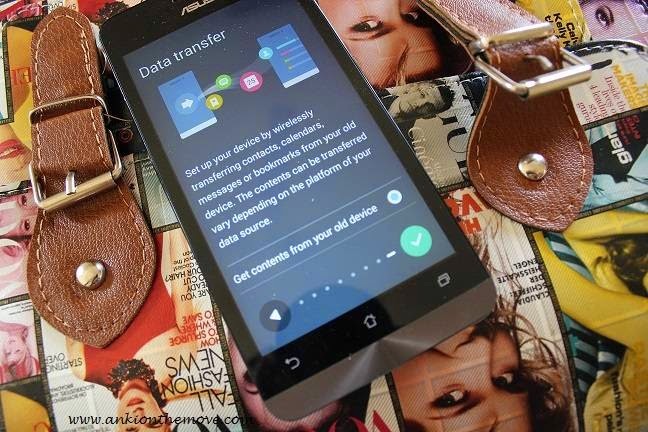 While Asus Backup creates a backup.A data transfer is a very convenient feature where you can transfer data from old device via Bluetooth. The.The transfer wizard takes you to options of selecting old phone manufacturer that already lists Asus,Samsung,Apple,Lenevo,LG etc…After selecting that you can choose the model.Like for me,I chose apple and then apple 5c .After we have successfully turned on the Bluetooth,you can do a data transfer. Recalling the very old feature that we used to have on some of the phones earlier,very basic as to what we are used to,Flashlight in Zenfone takes it to another level.So we have options such as white light with increasing frequencies if we want to constantly flicker the white light.We have options such as constant light or light as an SOS.The white light is very bright so can act as a torch while travelling or finding something. Newstand takes you to various highlights of the day that includes news of various categories from various sites such as MINT,Jagran,NDTV. Quick Memo.Quick memo act like sticky notes where you can take write anything on the draw panel and it comes in the notebook form. Enjoy your ZenUI personal service which approaches ASUS for direct interaction with regards to APPS and Latest ZenUI News.Based on various apps,these are like FAQ’s and User Forum which might help you whenever you are stuck with the app.My Asus takes you to online chat repairs service locations and etc.